Washington, D.C., circa 1924. "George Washington University group." Not afraid of Virginia Woolf. National Photo Company glass negative. View full size. Submitted by 20002ist on Thu, 05/10/2018 - 1:27pm. 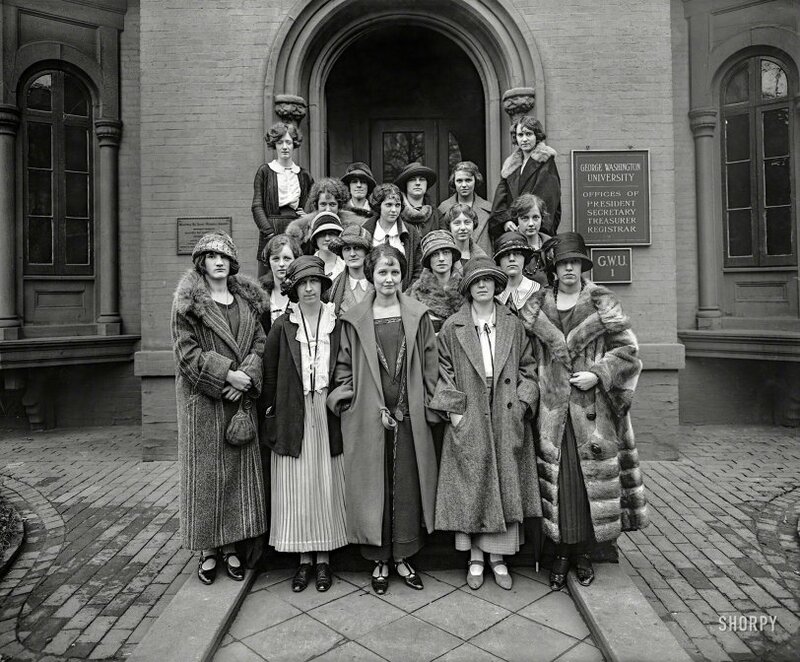 These ladies are posed in front of the Maxwell Woodhull House at 2033 G St. NW. Submitted by karenfryxell on Wed, 04/11/2018 - 1:56pm. I also had the thought - before I read the comments - that a couple of these girls ended up at the office Christmas party. I also swear that young woman in the middle near the back was in one of those Washington poolside beauty pageants. Submitted by deefer on Wed, 04/11/2018 - 8:34am. this lot would be leaving many corpses in their wake! Submitted by Grammy23 on Wed, 04/11/2018 - 8:17am. I love how these photos capture the fashions and customs of the day. It was obviously winter or cold weather given that nearly all are wearing a heavy coat. And check out those with fur. Most of the young ladies (although for some reason, ladies in this period all look so much older than they are) are wearing hats. Few are genuinely smiling. Has no one heard the expression “Say cheese”? Submitted by archfan on Tue, 04/10/2018 - 11:36pm. This year, the fashionable coed is wearing clothes from our new line, Dressing Up In Mommy's Clothes. So Helen, what are you doing after Graduation? Submitted by Vintagetvs on Tue, 04/10/2018 - 6:38pm. Oh I don't know Martha, maybe go work for Western Electric, I hear they throw great Christmas parties. I swear I thought that before I saw FlyTexas's comment! Submitted by FlyTexas on Tue, 04/10/2018 - 5:14pm. Wasn't it at the Shorpy office Christmas party?